Epidural Steroid Injections - The epidural space is a space inside the spinal canal between the bony canal of the vertebrae and the sac that contains the nerves, spinal cord and spinal fluid. The purpose of this is to try to provide a nerve block and to suppress the inflammation that is affecting the nerves that are carrying the painful signal to the spinal cord and brain. The nerve is usually being irritated by a disc. Arthritis, cysts, and various other structures can also cause nerve irritation. Typically, steroids and local anesthetics (numbing medication) are injected into the epidural space. There are two common approaches – interlaminar and transforaminal. Selective Nerve Root Blocks – This procedure is very similar to a transforaminal epidural injection. Typically, these procedures are performed with local anesthetic only. They are also requested by many surgeons as a diagnostic tool, so they can accurately decide if surgery is a good option for you. Facet Blocks/Medial Branch Blocks - The facet joints are located on the posterior aspect (back side) of the spine. There is one joint on each side (left and right) at each level, all the way from your cervical spine (neck) down to your sacrum (low back). Each joint has two medial branch nerves that innervate it. A combination of local anesthetic and steroid, or local anesthetic alone can be injected directly into the joint, or near the joint, where the nerve runs before it enters the joint. Typically, local anesthetic is injected to block the medial branch nerve as a diagnostic tool and provide you with temporary relief (hours). If this is successful, radiofrequency lesioning or ablation (RFL or RFA) is performed at a later date, providing you with longer pain relief (3-6 months or longer). Sacroiliac (SI) Joint Injections – The SI joint is formed by the sacrum (the low back bones which are fused) and the ilium (pelvic bone) which come together. It is a common cause of low back pain, and is usually worse with sitting for long periods of time. A combination of steroids and local anesthetic are injected into the joint to decrease inflammation and improve pain. This procedure is often combined with physical therapy to help improve SI joint pain. Sympathetic Blocks – The sympathetic nervous system may be another pathway for pain signals to be carried from the site of injury to the spinal cord and brain. Usually the pain fibers enter the spinal cord at a specific location known as a ganglion (collection of nerves). For pain in the face, upper extremity (arm and hand), and chest, local anesthetic is injected around the stellate ganglion. For patients with pain the lower extremities (legs and feet), a lumbar sympathetic block is performed at the L2 level. These blocks are typically used for patients with Complex Regional Pain Syndrome (CRPS) formerly known as RSD (Reflex Sympathetic Dystrophy). It is also used to treat Sympathetically Mediated Pain (SMP). Lysis of Adhesions – This procedure is used to treat patients who have undergone previous back surgery. After any surgery, scar tissue is formed. 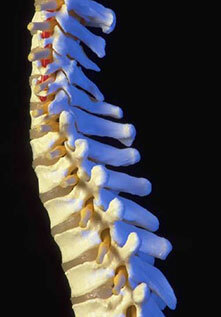 After surgery involving the spine, scar tissue can form around the nerves. This is frequently diagnosed by MRI. During the procedure, a needle is passed into the epidural space via a caudal approach (near the tailbone). A catheter is passed through the needle to the level of the previous surgery. Contrast dye is injected to see specifically which nerves are affected. A medication that helps dissolve scar tissue, local anesthetic, steroids, and hypertonic saline (to dehydrate the surrounding tissue) are injected into the epidural space. This procedure usually provides significant relief to patients with previous low back surgery. Genicular Nerve Block – This procedure is performed for patients with refractory knee pain. Usually patient have tried and failed treatments including medications, physical therapy, steroid injections, visco-elastic supplementation (Synvisc, Orthovisc, Hyalgan, etc), and even knee surgery or replacement. There are three nerves located near the bones above and below the knee. The nerves can be blocked with local anesthetic only, steroid, a combination of both, or even radiofrequency lesioning (below). We have had tremendous success with this procedure for patients who have undergone knee surgery, even replacement, and for patients who are not candidates for knee surgery. Radiofrequeny lesioning or ablation (RFL or RFA) – This procedure is typically performed on the medial branch nerves (#2 above). A special type of needle (radiofrequency cannula) is placed near the nerve. A probe is placed inside the cannula and testing is carried out to ensure the cannula is close enough to the nerve. The other end of the probe has a wire which will connect to specialized machine called a pulse generator. Once accurate placement is confirmed, local anesthetic is injected to numb the area. After the local anesthetic takes effect, the pulse generator sends an electrical signal to the tip of the cannula, at a specific temperature, for a specific duration of time. This heats the nerve and surrounding tissue and provides longer lasting pain relief, usually 3-6 months or longer. This procedure is also performed on the genicular nerves (see #7 above) and various other nerves. Spinal Cord Stimulation (SCS) – This procedure is performed for patients with previous spine surgery who continue to have neck and arm, or back and leg pain. It is also used to treat CRPS. New indications for SCS are being approved every year, and it is one of the most studied pain treatments, with significant effort in future developments. In many other parts of the world, SCS is used to treat angina (chest pain due to decreased blood flow to the heart), vascular (blood vessel) disease, and neuropathic pain conditions (diabetic neuropathy, etc). The great part about this procedure, is you get to do a test drive before you commit to the permanent! This procedure is performed in a very similar manner to an epidural steroid injection. One or more needles are placed into the epidural space. Depending on your specific condition, 1 to 4 wires are placed into the epidural space through the needles. Each wire as multiple contact point on it. These contact point are used to generate an electrical signal in a specific pattern to the spinal cord, which helps block the transmission of pain. These wires come out of your body and connect to an external battery (trial portion). The permanent system (performed at a later time at a surgery center or hospital) has all the wires and the battery under the skin. You will have a remote control, to turn your system on and off, change the program (channel), and change the intensity (volume). It’s simpler than using a TV remote control. Most forms of SCS use parasthesias (tingling which is very pleasant) in your painful areas to help reduce pain. One of the newest areas of interest in SCS, is paresthesia free stimulation. This allows pain relief without any of the tingling. Currently, the physicians of The BPC work with four companies to provide SCS to our patients: Medtronic, St. Jude, Boston Scientific, and Nevro. We encourage you to visit their websites, and learn more about SCS. Drs. Chhabra and Chang place SCS for our patients. Kyphoplasty – This procedure is performed for vertebral compression fractures (fractures of the bones of the spine). The most common causes of compression fractures are osteoporosis/osteopenia (thinning of the bones), trauma, and cancer. A needle is placed into the bone and a balloon inflated. Once the fracture is reduced (bones put back into a more normal position), cement is injected into the bone to stabilize it. Almost 90% of patients who have kyphoplasty performed for a recent compression fracture, experience pain relief within a few days of the procedure! Drs. Chang and Chhabra perform kyphoplasties for our patients. Discography - This is a diagnostic test. The physician inserts a needle into the intervertebral disk. Contrast or dye is injected into the disk. The physician may measure the pressure inside the disk if necessary. During the contrast injection, the patient is asked to report if the additional pressure on the disk reproduces his or her pain. This lets the physician know which particular disks are painful. Once the procedure is completed, the patient is taken to a diagnostic center for a CAT Scan of this area. This test will reveal any disk that is disrupted. This means that there may be tears in the outer ring of the disk that were not seen on a MRI scan. This test is the best way to make an accurate diagnosis of a disk problem in some cases. Intrathecal Pumps (limited basis) – These pumps are implanted under the skin. A catheter (tube) runs from the reservoir under the skin into the intrathecal space (the space where the spinal cord, nerves, and spinal fluid are contained). Medication is continuously infused into the intrathecal space. The most common conditions treated with intrathecal pumps include cancer pain, spasticity, and many forms of non-cancer pain. Currently, we are not placing new intrathecal pumps. We are also not accepting new patients for pump management who do not have cancer pain. However, if a study (such as a dye study) needs to be performed, we will be happy to perform this study and report the results back to the requesting provider. Joint or Bursa Injections – Typically steroid and local anesthetic are injected into a variety of joints and bursa to treat pain, inflammation, or arthritis. For some joints (knee), visco-elastic supplementation such as Orthovisc, Synvisc, Hyalgan, Supartz, Eufflexa, etc. can be injected. This has shown to provide longer lasting relief when compared to steroid injections into the joint. Typically, patients experience pain relief of 6 months or more with visco-elastic supplementation. We currently use Orthovisc or Synvisc for visco-elastic supplementation in order to maintain compliance and minimize costs to the insurance carriers in the area. Tendon Injections - This involves injecting steroid and a local anesthetic into a tendon insertion area. This decreases pain and inflammation. This is a very easy and effective way to treat tendonitis pain.